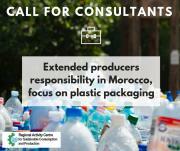 SCP/RAC, within the UN Environment/ MAP led Marine Litter Med project, has launched a call for consultants to offer technical support to develop a process of integration of the principle of the extended producers' responsibility (REP) in Morocco. In particular, this technical assistance should focus on packaging waste, including plastic packaging. Interested applicants are invited to submit their bid by 14th December midnight (CET) following the instruction laid down in the ToR.